A Bangor University psychologist has been invited to Hollywood to collect a television and film industry Award. Dr Simon Watt, of the University’s School of Psychology is to receive an Award from the Society of Motion Picture and Television Engineers, the influential global society and technical standards-setting agency for the movie and television industry. The Awards recognise outstanding industry members, and take place at an ‘Honors & Awards Ceremony’ in Hollywood, California on Thursday 24 October. The Award is for a research paper on ‘Stereoscopy and the human visual system’. 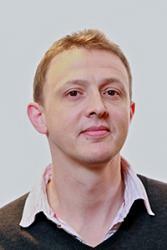 The Society requested a paper from Simon Watt and his research colleagues for their Journal. This followed the Society of Motion Picture and Television Engineers’ invitation to present a vision science session on 3D viewing to an audience in New York which included senior figures from movie studios and companies such as Disney and Sony. “I think this is a nice example of how academic vision scientists can carry out basic research that is relevant to an industry that affects us all, and I am pleased that they recognise the implications for their industry,” commented Simon. The SMPTE Honors & Awards Ceremony is being held in conjunction with the SMPTE 2013 Annual Technical Conference & Exhibition at the Loews Hollywood Hotel in Hollywood, Calif. Further details about the event are available at www.smpte.org.